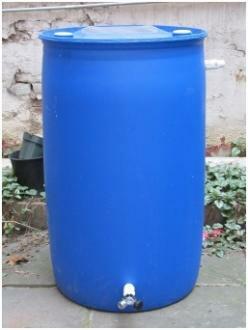 Each rain barrel from the ECA is made from nearly 100 percent recycled materials. | Photo from ecasavesenergy.orgSince 2011, the Energy Coordinating Agency (ECA) has been running the Philadelphia Water Department’s free rain barrel program, distributing a couple thousand barrels each year to city residents. While the program has been successful, the ECA has found that stormwater problems don’t end at the Philadelphia border. “There’s lots of flooding in surrounding communities, and people see that they are living with a system that is essentially broken,” says Liz Robinson, ECA’s executive director. After a workshop is held near the suburbs, Robinson says they’ll get waves of calls, asking for rain barrels. However since funding only covers a Philadelphia program, ECA has had to turn away those residents. A brand new barrel without rainspout fittings can cost as much as $100; ECA buys recycled barrels from wholesalers for around $15 then hires people to assemble the fittings. For Philadelphia residents, installation is free. For those in the suburbs, installation, which includes the barrel, is $100 (without installation is $85). An assembled barrel can also be picked up for $60 at the ECA headquarters on Arch Street. The West Philadelphia nonprofit We Never Say Never (WNSN) helps ECA hire for these jobs. Adrienne Hughes, a volunteer supervisor at WNSN, says the group has a crew of about four men working on the barrels at any given time, though that number can increase to as many as 10. Workers get $20 for each installation, and, as a kind of commission, $30 for clients they recruit. “The guys who do the work, they come from right here – the neighborhood, family, friends … people who want to work and will do a good job,” says Hughes.